While this inspiring book is mind-blowing and insightful it is also humorous and accessible. It proves brain and mind are separate entities and that mind lies outside the space-time continuum — where science meets religion. Understand the true nature of reality, why we survive death, and how science could complement religion and reveal the true location of Heaven. The paranormal is explained, classic arguments ‘for’ and ‘against’ God are discussed, and a new ‘External Consciousness Argument’ is introduced to counter arguments such as Richard Dawkins' ‘Ultimate Boeing 747 Gambit’. The Bible creation story is shown to be compatible with science and evolution, an argument for eternal life is presented, and enigmas like why God would allow bad things to happen are resolved. Compatibility between destiny and free-will is explained, as is how to discover your purpose in life by examining your 'destiny-chain'. If you never imagined there was a sound logical argument for belief in God then this book might just prove to be your godsend. 'If only this book was written centuries ago when wars were fought over the conflict that is Religion vs. Science maybe we could have avoided them! 'I am not a Christian but I still found Ian's arguments and revelations thought-provoking where my own faith and religion are concerned. I am a Hindu and as such I believe in reincarnation and that we must pay for the sins of our past lives in this life or we will be rewarded for our good deeds/behaviors of our past lives in this live; so when Ian talked about his belief that "both evidence and logic suggest our consciousness survives death," I was intrigued. As I continued to read I was struck by the magnitude of Ian's revelations regarding matters such as destiny and free-will and the meaning and purpose of your individual life. This is not a one-time read in my opinion; to gain the full benefit of this book I will be reading it several times and each time I have no doubt that I will learn something new. As I continued to read I found that this book will help anyone of any faith gain some insight into their own faith as well as science and how the two are connected. I have learned quite a bit reading this book, although I am not sure that I believe everything the author writes about. It is an interesting notion that Science and Religion (and so by default God) are one and the same and are only viewed from a different perspective... I have to admit I have thought about the debate regarding evolution and would have to agree with the author that if God did not want evolution to occur then it would not have. Ian Kingsley has taken this debate a step further in an all encompassing debate regarding the age-old conflict of Science and Religion and has come up with a truly unique outlook regarding the two. I enjoyed this book very much, although to be honest I didn't think that I would, but his humor and his ability to clearly lay out his thoughts on paper made this book very interesting and enjoyable. 'Reality Check: Science Meets Religion is a great book for anyone one to read, especially if you have ever wondered about Religion and Science... I can't say that I have ever given this subject much serious thought but I have thought about it in passing, and Ian Kingsley's book has provided more food for thought. His thoughts and justifications are clearly laid out making it easy for the reader to understand and they are all well researched and documented which I found refreshing, because he was able to support his theory in a logical manner as opposed to just writing a book about his own personal beliefs. 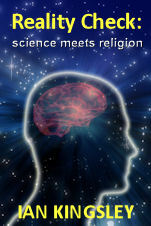 'I did not know what to expect when I began to read 'Reality Check: Science Meets Religion'. It is a great book for anyone who is curious about Science, Religion and Evolution (which I guess would also be classified as science! ), and how they all meet and interconnect. The discussions/arguments for and against both science and religion/God allow the reader to compare the different viewpoints and reach their own conclusions regarding the debate. 'Reality Check: Science meets Religion' has most definitely given me a different outlook regarding the age-old argument of science vs religion. I have never believed that there can be only one or the other, and Ian Kingsley’s book has served to cement my outlook regarding this subject. I found his comparisons both for the existence and lack of existence of God, and the fact that the belief in science or the belief in a God does not necessarily mean that the other does not exist, thought provoking. 'Reality Check: Science Meets Religion' was a very interesting book. I found that the author has done a wonderful job presenting his argument regarding his beliefs where science and religion are concerned. It was refreshing that Mr. Kingsley has done so much research because most of the time books such as these are all based in personal opinions and have no basis or even a coherent argument for why the author is asking you to believe what they are saying.